Helena and Vikki, the “sassy twins” as they call themselves, ooze confidence. Handle the heat: My Kitchen Rules 2014 entrants. Manu Feildel, with Pete Evans, says the 2014 contestants are teaching the judges a trick or two. Does familiarity breed contempt or contentment? We might find out by the end of the fifth season of My Kitchen Rules, the one-time reality cooking show upstart that became a ratings powerhouse, crushing all before it last year. Based on the first three episodes – including a Monday-night debut that drew 1.67 million viewers nationally – the Seven Network hasn’t unduly tampered with the recipe for its hit series. 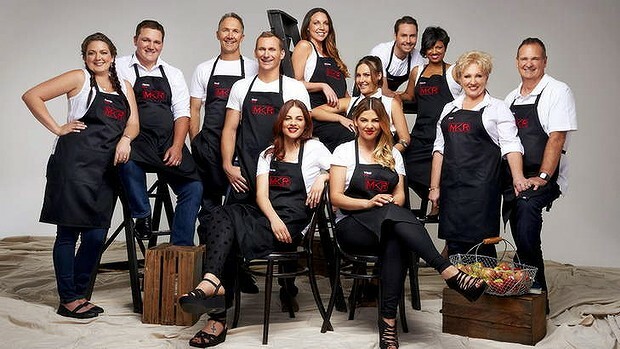 While there’s a zippy new energy to the editing of its direct rival, Nine’s The Block, My Kitchen Rules moves to the same rhythms, albeit with some spillover from its previous success. Judges Pete Evans and Manu Feildel are now greeted with reverence, except by feisty grandmother Deb, who has more tactile feelings for the dapper double act. “I’d like to roll around in that hay with him,” she says, spying Evans and some hay bales. Carving out the villain role … Perth’s Kelly Ramsay is only a mild take on last year’s cast. Contestants for the show’s initial episodes, where they host revolving home dinners for the judges and each other, tend to utter reality cooking show platitudes like “food is my life”, but the truth is that it’s the social element that marshals our interest each year. These are amateurs – some ambitious, some skilled, some hopeless – and it’s the chance to venture into their private homes and personal menus that attracts the audience. While it may feel like you’ve seen half the series already, thanks to extended promos during Seven’s Australian Open tennis coverage, there’s actually much to be determined. Most crucial is the question of using an archetypal villain, after it backfired last year when Jessie Khan and Biswa Kamila received death threats and racial abuse on social media for their entertainingly horrid tactics, before Ashlee Pham and Sophie Pau took over and riled a sizeable proportion of viewers with their dismissive insults. Framing female teams with a South Asian and then Asian heritage as villains was worrying. Based on the first batch of six teams, there are rivalries, disdain and some preening arrogance, but no overt moustache-twisting villainy. Perth friends Chloe and Kelly came the closest, mainly via their privileged sense of entitlement as opposed to overt aggression. “Nothing but the best for us,” was their self-declared motto, and they reflect the ability of My Kitchen Rules to capture fault lines and divisions behind the myth of Australia egalitarianism. The two women both work in the boom state’s oil and gas industry, and Kelly judges other entrant’s food against versions of the dishes she has eaten overseas; the goat’s cheese croquettes from country NSW’s Annie and Jason didn’t compare to those she’d eaten in Spain. “There’s not enough room in this competition for two young girl teams,” Chloe claimed, eyeing off Victorian twins Helena and Vikki (whose “two heads, one brain” equation might need refining). But no-one would ever expect to hear, “There’s not enough room in this competition for two young bloke teams”. Still, as of the first week there’s been some care taken in the editing to round out the profiles of the contestants. Then again, My Kitchen Rules is a show that preys on self-doubt; a healthy ego and self-belief might be essential. Tuesday night, Canberra couple Andrew and Emilia were optimistic, with his wacky voices and her repeated use of “awesome”. They’d barely started cooking when the pair, who’d been together for all of three months, started cracking. The wacky voices were replaced by a staccato annoyance and exasperation took hold amid kitchen crises. And I’d wager that of the three initial episodes, completed by Gold Coast friends Paul and Blair with their Bali-inspired cuisines, Andrew and Emilia’s failure generated the most feedback from horrified but rapt viewers.